It’s been a mad house around here since the holidays. Just getting the Christmas decorations put away has taken nearly a month. As for cooking, there’s been very little of it. I have relied upon take-out dinners and soup lunches. Since today is Valentine’s Day, I am renewing my love affair with Blimpy Girl meals and focusing on getting back into my normal eating groove. The holiday grazing has come to an end. This out-of-the-bun hot dog was today’s lunch. Make a lengthwise slit in a turkey dog (98% fat-free), fill the slit area with small chunks of Velvetta cheese (1/2 ounce) and top with diced onion. Microwave the dog until cheese melts. 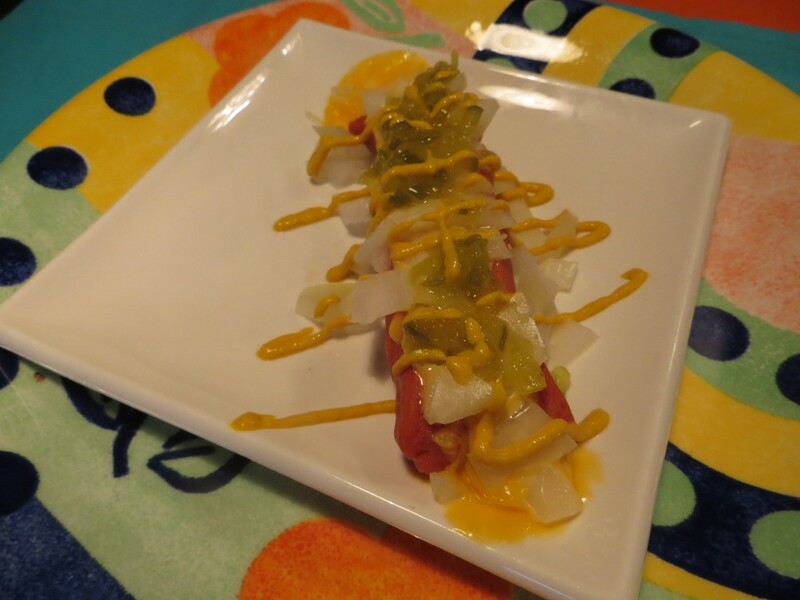 Plate cooked hot dog and garnish with sweet relish and mustard. It’s a 100 calorie hot dog. Preheat oven to 450 degrees. Use a broiler pan with a wire rack to keep air circulating around the potatoes while they bake. 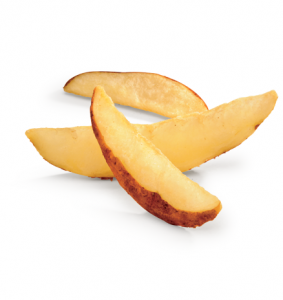 Wash and cut the potatoes into wedges. Mix the oil/seasoning to a large bowl and thoroughly coat the potatoes. Layer the wedges on the wire rack (single layer) and bake in oven for 10 minutes. Flip the potatoes and cook an additional 8 minutes or until golden brown. Serve immediately. The above recipe serves four. Calories per serving are in the neighborhood of 170. Potatoes are a “filler” food. The carbs help your tummy fill full which means you eat less.Say bye-bye to the ketchup. If you can’t live without a dipping sauce, use low-fat ranch. The final verdict: An under 300 calories meal with a serving of the baked fries.